Brilliant blue and beautiful light are yours! This compact table lamp packs a powerful punch of colorful style that will compliment your room. 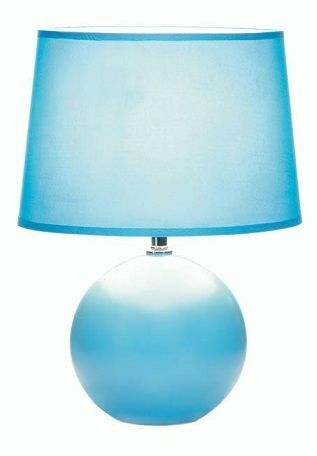 The round ceramic base is finished in cool blue with a matching fabric shade. LED E26 (60W) light bulb not included. Base: 7 1/4" x 7 1/4" x 10 1/2" high; shade: 11 1/4" x 11 1/4" x 7 1/2" high; power cord is 62" long. Dimensions: 11.2" x 11.2" x 15.5"